There comes a time in the life of every homesteader when you look at your breakfast plate and you see the homegrown eggs, the garden fresh vegetables, maybe the homegrown bacon, and you start to wonder what life would be like if you had a glass of raw milk from your own cow or goat to chase it down. And therein lies the ultimate question: Cow vs. Goat? There are several things to consider when deciding cow vs. goat. How you answer will help you choose which dairy animal is the right for your homestead. Even if your heart is set on having a cow, it may not be a good fit for your situation and it would be unfair to her for you to figure that out the hard way. Here are 12 things you should consider when making this important decision. Goat vs. Cow? Which Should You Raise on Your Homestead? This is pretty important. All of the other considerations don’t matter if you don’t like the flavor of the milk coming in from your barnyard. Why go through the hassle if you won’t drink it? Which flavor of milk do you prefer? Don’t expect raw cow’s milk to taste the same as what you’re used to from the store. Now that we’ve been drinking our own cow’s milk for years the stuff at the store tastes an awful lot like when our milk is starting to sour. The upfront cost of purchasing a cow is significantly higher than a goat and definitely not something you want to get a deal on. In the dairy world, you get what you pay for. If you got a killer deal on your livestock, don’t go bragging it up too much. Either you or the seller got the short end of the stick and only time will tell which one of you it is. (And I can say that without insulting you because both our cows were great deals. .. and both came with their problems.) Cheap animals could be sickly, incapable of breeding, have a bad temperament. Whatever. you. do. Do NOT buy your animals at an auction. You don’t know anything at all about those animals- where they come from, how they were raised, what health problems they might have. Many (most?) of us simply don’t have enough livestock experience to recognize issues in animals to make wise decisions in a high-pressure environment. While you can probably find a decent goat for a couple hundred dollars, when buying a cow you can expect to spend at least a grand. How Much Milk Do You Need? Depending on the breed, goats will probably give you just enough milk to drink and a bit more to play with. Cows, on the other hand will most likely give you a surplus of milk you need to manage. 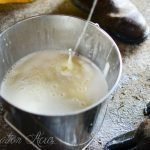 It’s a good problem that will turn into butter, yogurt, and cheese or can be used to supplement the feed bill by giving it to some of the other livestock on your farm. Goat’s milk is naturally homogenized which means that the fat globules are smaller and don’t rise to the top of the jar to form a cream line. Which, in turn, means if part of the attraction in having a dairy animal for you is using cream to make butter, a goat might not be the best fit. However, this fact is good for folks who are lactose intolerant. While it’s not the cream itself that makes the milk more digestible, it’s the size of those smaller fat globules that do. If you have problems digesting cow’s milk, drinking goat’s milk (or trying to drink A2/A2 cow’s milk) may solve your belly troubles. 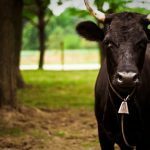 How Much Pasture Do You Have? A milk cow (regardless of breed) is going to need significantly more acreage than goats. While you can feed 5 or more goats on 1 acre of good pasture, the rule of thumb is 1 head per acre with cattle. Remember, you’ll need more than that if you plan to keep her calf or kids for any length of time. And you’ll need more if your pasture quality is marginal. While smaller cattle breeds may eat less, that’s not always the case and with the lower feed bill also comes lower yields. What is the Quality & Content of your Forage? Goats can thrive on good grass, weeds, or brush, a cow needs a pasture growing high quality grass. They pretty much won’t touch the weeds. If your pasture is poor, there are economical ways you can work to improve it over time such as using goats to clear brush, using sheep for pasture clipping, pastured poultry for fertilization, rotational grazing, and winter hay-feeding systems that will gradually reduce the lower quality forage. But the fastest route to a quality pasture is to make the investment and seed it with the forage best suited for your livestock and climate. Check out these tips for raising goats sustainably. Can You Afford to Feed Hay? Goats, little escape artists that they are, need more secure, permanent fencing with 4″ squares (so they don’t stick their heads through) that is at least 4′ high. Since goats will climb the fence, you may want to consider running a strand of electric around the inside as well to discourage that behavior and protect your investment and possibly even the life of your beast since escaping and getting stuck in the fence decreases their protection from predators. Cows on the other hand can be trained to respect a very inexpensive and portable fencing system using step-in posts and polywire (or polyrope). 50% of our pasture is not permanent. The only issue we’ve had with this type of fencing is when calves, who seem to care less if the fence is electrified or not, break through. For us, it has only been a problem for the first few weeks. After that they tend to hang out with the rest of the herd. Obviously, cows outweigh goats by several hundred pounds and if you aren’t used to handling large livestock or are nervous around them, a goat may seem like a less worrisome option. You can’t push a cow around when she doesn’t want you to (which is when grain bucket training comes in handy), whereas you might be able to strong arm a goat if you need to. Goats are more lively, playful, and entertaining than cows. Of course, that can be interpreted as ornery and mischievous as well. Cows are definitely more laid back and mellow. Which you choose could depend on if you’re up to dealing with goat antics. Goats are generally easier to breed than cows. Bucks are easier to find than bulls and while you can always resort to artificial insemination with cows it’s not as reliable as live coverage from a bull. Birthing complications can happen with either cows or goats, but you can choose a cow breed that is an easy calver with a lower risk of issues. Goats tend to have birth multiple kids and that increases the risk of complications and intervention. When your dairy gal freshens you have to consider what you’ll do with the new offspring. Is there a better market in your area for cows or goats? Are you prepared to raise her offspring for meat? If you don’t have a trailer or the availability to rent one, transporting cows is going to much more difficult than hauling goats which could, in theory, fit in the back of a truck (or van!). 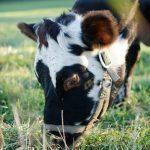 How you answer these questions will help steer you in right direction as to which dairy animal is right for you and your homestead. I have had both. I prefer goats. They are harder to keep fenced, but when a cow goes in to heat and wants to “get friendly “, I find their size and pushyness a little to much to handle, now that I am in my sixties. Good point! I’ve heard some crazy stories. We have just the opposite problem here though. Our cows have always been less than demonstrative making it tough to tell when they’re in heat. It can be frustrating. You can get cream from goats milk it is naturally harder to separate but it does separate you just have to wait a bit longer. Like most animals though, breeds have different fat content so it is easier to get cream from Nubians and Alpines than say a pygmy. I did a video on my fb page a while back about this. And the first thing I said it taste! Great minds! I’ve become a cow person by far. Nothing has made me want to fire up the grill more than an unruly goat. I’ve given unruly cows much more grace.. Maybe subconsciously, but nonetheless. Those cows put more in my kitchen by way of milk, butter, ice cream, cheese, steak, roast, bacon, chops and sausage. Plus the dog food bill has some cushion. But all of that to say, I still have my goats. Little boogers.